Ah, the many joys of flying with a child. Where to begin? The ridiculous amount of items you have to pack? Standing in a never-ending line to check said items? Knowing that no matter what time your flight, you’ll disrupt at least a nap or a meal, if not both? 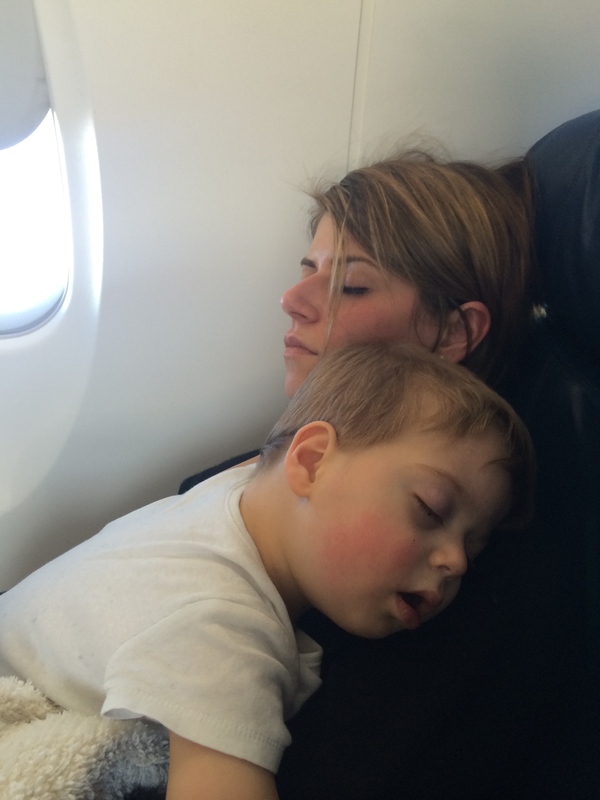 The biggest joy of flying with a child, of course, is the actual flying. We’ve flown with H basically every six months of his life: 6mos., 11mos., 1.5, and soon at just about 2 years. The wonderful thing about children this age is that they are continually changing, growing, and surprising you. Something that seemed insurmountable, unpronounceable, or simply unfathomable the day before is suddenly something executed with such practiced ease, you can scarcely remember a time you didn’t have a tiny person standing on your coffee table throwing crackers to the dog. This also means that their demeanor, triggers, cheerfulness, and everything else can change in an instant, too. My child who was an absolute dream to fly with at 6mos. was a holy terror at 1.5…and this is our story. En route back to Minneapolis from Hartford, we learned what it was to be “those people”. H had missed both a normal meal as well as nap time and things went downhill very quickly. It’s hard to comfort a child when you’re in a three-seat row and only have two seats. And when the seatbelt sign is on and you can’t get up. And when there is just no consoling to be had. Basically, he cried for nearly an hour with nary a pause save to gulp air for more crying. We tried food, water, distraction, comfort, singing, iPads, a new diaper, pacing (once the light went off)…everything we could think of. I knew he was tired and I knew there was nothing I could do but wait him out: he’d either fall asleep from exhaustion or make me permanently deaf. Luckily, the former won out. But not before I caught a few nasty looks from other travelers as well as overheard the woman in front of us ask the flight attendant if there was “any sign of it quieting down back there”. Now, I’d like to pause here by saying that naturally, I have been annoyed by a child on an airplane. Who hasn’t? Particularly as I’ve aged and gotten closer to having a child of my own, I’ve tried to be charitable about it, especially when it’s a crying child (versus an under-supervised misbehaving child). That said, it grates on you. I get it. I’ve been there. I once flew from Amsterdam on a flight with a child who – I kid you not – cried the entire 8+ hour flight. The parents know that it’s loud–it’s loudest next to their eardrum. Your exaggerated sighing is not helpful. The parents know that it’s been going on forever–they are counting the seconds until the flight lands and they can escape your glare. Your reproach is not helpful. The parents know that “some kids like X”–they have tried every trick up their sleeve and then some. Your suggestion is not helpful. Here’s the thing about flying–it’s public transportation of a more expensive, annoying variety. You never know who’s going to sit next to you or what you’re going to encounter (this blog is testament enough to that). Like life, however, you have to try and make the best of it. And for heaven’s sake, be nice to that poor parent. She wishes it was over, too.